Vandewiele offers complete carpet solutions, from granulate to carpet. The portfolio contains BCF extrusion lines, heat-setting, tufting and carpet weaving machines. The synergy of competences in these different fields leads to important technical breakthroughs in the benefit of the customer. DOMOTEX is for Vandewiele the opportunity to meet all present customers and many prospects for future business. Of course, it is important to participate to show the presence in the market, but it also is the opportunity to strengthen the long-term relationship with the customers. And it’s the perfect opportunity to present the company' s latest developments and products to the carpet industry. 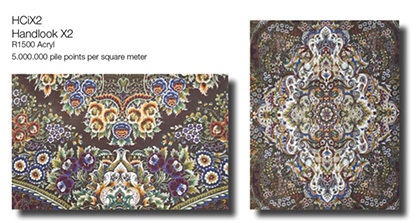 The final quality of a carpet is mainly dependent on the quality of the yarn being used. Vandewiele' s experience in woven and tufted carpet, combined with the technological know-how of efficient yarn production, has led to the development of the current line of extrusion equipment. The technological support in combination with the knowledge in further downstream processing is unique in the world and contributes significantly to the success of their customers. After extrusion, yarns are often cabled and heatset. The French company Superba, part of Vandewiele, is since many years a world-leading manufacturer of heatsetting equipment. They have developed a unique and highly performing system using saturated steam as to set many different kinds of raw materials including polypropylene, polyamide, acrylic, PET, wool,...The space-dyeing machine which allows printing a random pattern of colours on the yarn is already a big success. It gives the developer endless possibilities to create new and interesting designs which can be used in woven as well as tufted carpet qualities. And the success story continues with the introduction of new Multicolored BiColor Frieze (Textured) yarns that will open new opportunities for carpet designers. The Most flexible Tufting system on the market. With the Colortec and its ICN technology, the Individual Control Needle, a higher efficiency and quality will be reached. It will only tuft pile where required and therefore saving yarn for shaped carpets. Moreover, this allows you to tuft with “weaker” yarns (e.g. 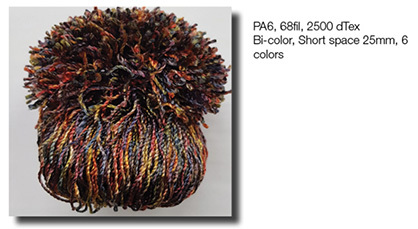 wool), less yarn on the back and this up to 12 colors and multiple color mixes. The Colortec can be combined with an IPD system for active yarn feed. 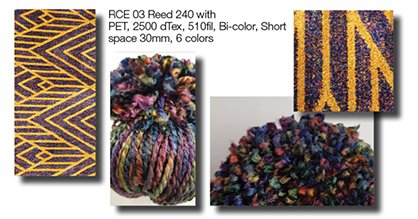 This allows a much better pile control, resulting in a cleaner surface of the fabric, a wider range of yarns and yarn counts for a different look, feel and pile heights. Using Tuftlink software an exact individual yarn consumption can be calculated resulting in less waist yarn. 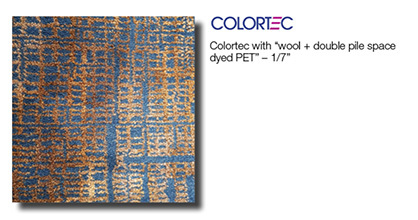 The Colortec combined with a Small Creel creates a flexible system for quick color change and small runs. The HCiX2 Handlook Carpet Innovator is a high density carpet weaving machine using the patented three rapier weaving technique with stationary incorporated pile yarns, giving a clear back, less incorporation and a higher weaving efficiency. The design on the pile side is crystal sharp. There are no visible warp yarns on the backside, which makes the carpet look like real handknotted. 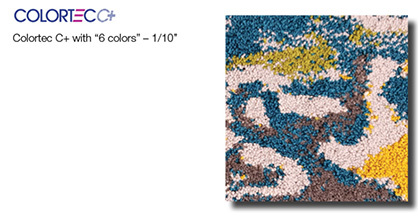 The HCiX2 carpets in acrylic, viscose, polyester,... are woven with optimized efficiency. Designs in the border, filling effects and natural fringes are all possible. The newly developed handlook carpet weaving machine has a reed density of 1500 d/m in 8 pile frames. With this execution of the HCiX2, carpet qualities up to 5.000.000 pile points per square meter are reached!